You will be hunting in Wildlife Management Unit WMU 64A. The general vicinity is a mixture of croplands, large tracts of hardwood/softwood forests with rivers and swamp. 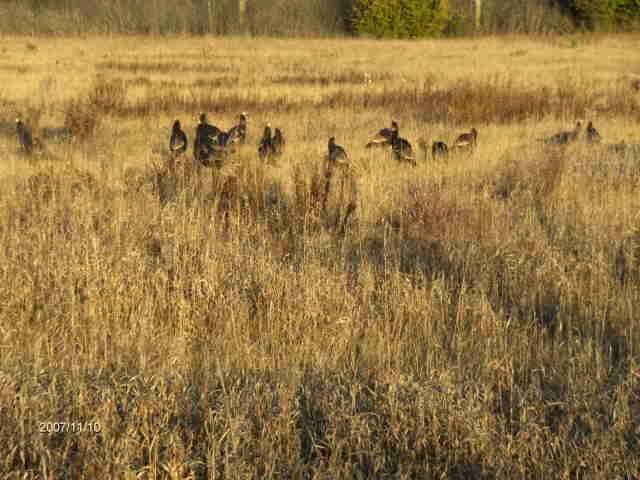 The Wild Turkeys are free ranging, no fences, providing a fair chase hunting experience. Every creature needs space to roam, hunt, and breed. Wild turkeys need 40 hectares of woodlands. Ruffed grouse will settle for four. Hunters are taken out to set up and usually pick their own site with guidance. Provide your own decoys and you do the calling, it is all part of your hunting experience. There is almost no hunter pressure. We've had hunters harvest almost anytime during the season. It's hunting though, no promises, these are wild birds. Waiting for Turkey Season, try Coyote Hunting. It will hone your confidence and patience making you a better game hunter. In WMA 64A to hunt Coyote you only need a Small Game licence. try your luck at Coyote Hunting at NO additional cost. Which week will you be hunting? Copyright 2017 ©The Triple "R"